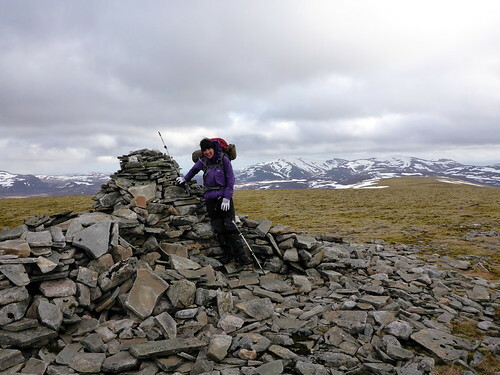 I’d been looking for a suitable weekend to make it round the Tarf 6 with Sick Kid – I’d done the Munros on the circuit last April but she needed to pick up the hills and it makes no sense to try and do these hills as singles from an efficient use of kilometres perspective. 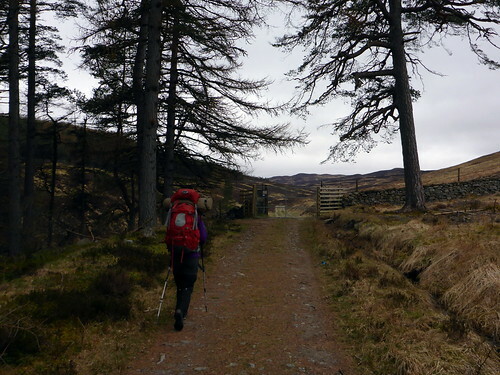 We’d decided to reverse the route I’d taken and do an evening walk in to the bothy at Allt Sheicheachan, tackle 4 of the hills the next day ending up at the Tarf Hotel and do the last two on the final day as a walk out. 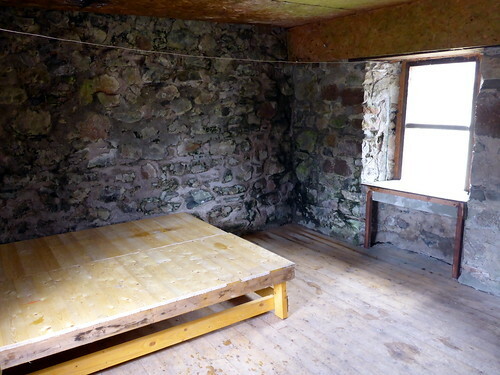 Seemed reasonable, however, we’d never stayed in bothies before and were both a bit apprehensive about the crazed folk that can inhabit such places – so we packed the tent to be on the safe side. 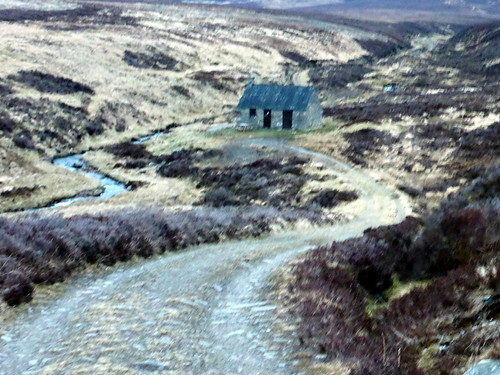 Got to the car park at Bridge of Tilt for about 6.30 and reckoned on being at the bothy in 2 hours. The forecast for the weekend had steadily worsened, with our old friend the wind being predicted to be gusting up to 65mph – oh joy! However, so many weekends recently have been windswept that we’re just getting used to getting pulverised. 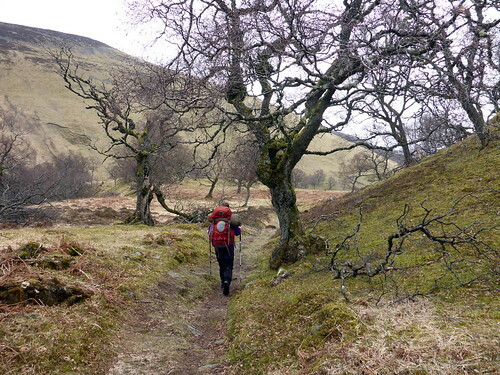 The walk in was quite pleasant – the light held til we arrived at the bothy, but other than a buzzard soaring in the distance there was no sign of life. 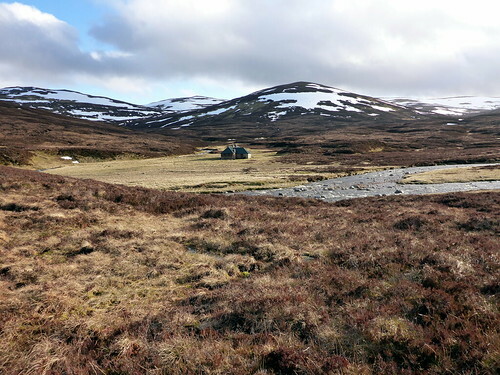 There were signs of industrialisation however, with a new pipeline being bulldozed into the hillside of Glen Bruar, behind the bothy – that was new from last time I’d been here. We found the place already inhabited by a couple of very posh St Andrew’s students (are there any other kind of St Andrew’s students?). They’d had a consignment of logs delivered that day for their stay and were very friendly and obliging. 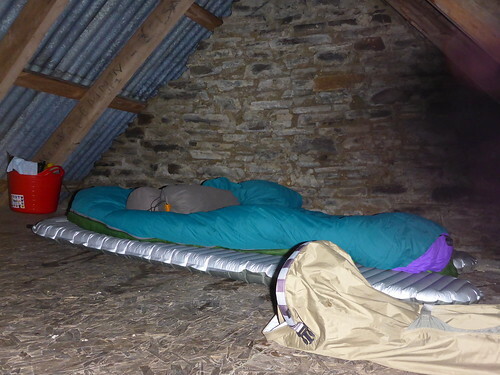 We chatted for a bit, enjoyed the warmth from their logs while we polished off our very healthy M&S salads then decided to head next door for the sleeping platform in the attic rather than have to suffer conversation. 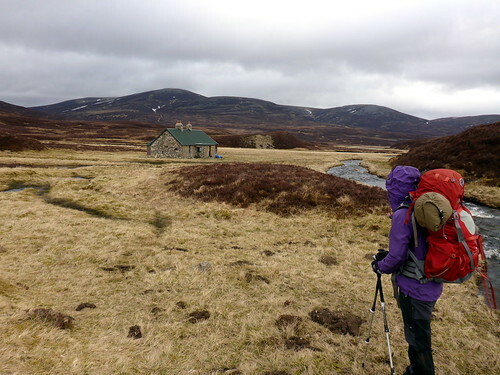 A we were leaving another walker arrived who did decide to stay in the warmer part of the hoose. 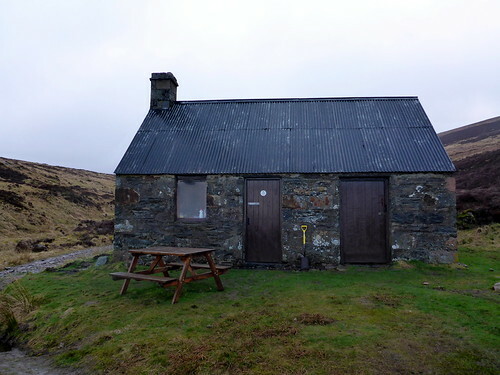 I was glad to have been in the bothy as the wind howled all night and there was a period of heavy rain around 4am which would have resulted in having to carry a wet, therefore heavier, tent around all day. 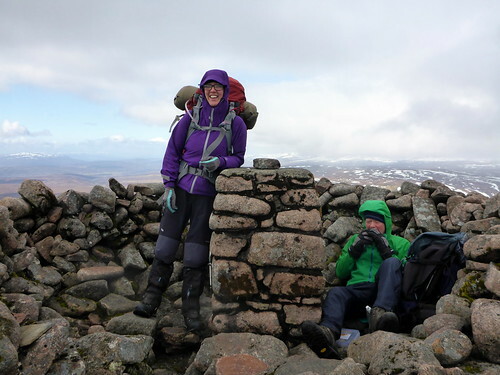 We breakfasted and set off for Beinn Dearg at a modest start time of 9.30. 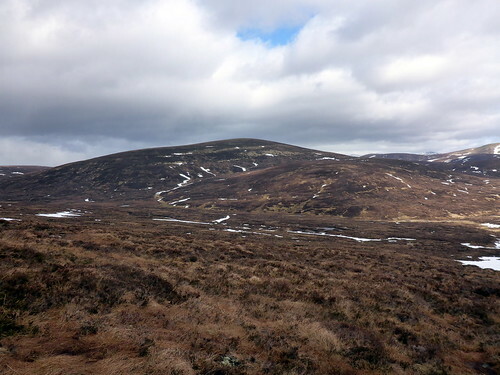 It’s a steady climb up the zigzag path then onto boggy heather. 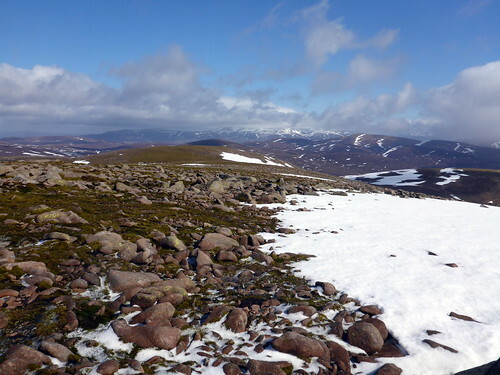 Not much snow left, the landscape predominantly dark brown from the heather. 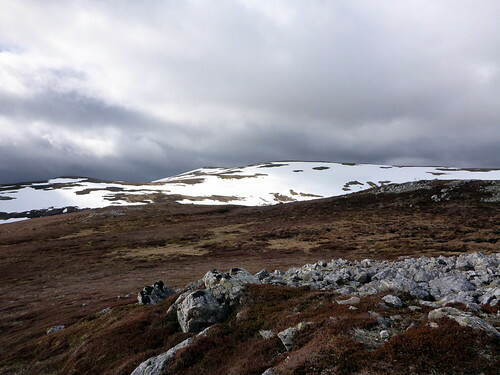 Near the summit we could look north to where the Monadh Ruadh glistened white in the sunshine. 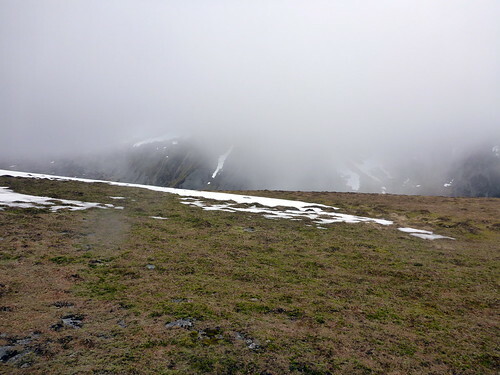 At the top we met the other walker from last night enjoying a piece – he looked a healthy old man who said his Munro days were pretty much over but he liked long walks – he was planning to walk to the Tarf Hotel and back. 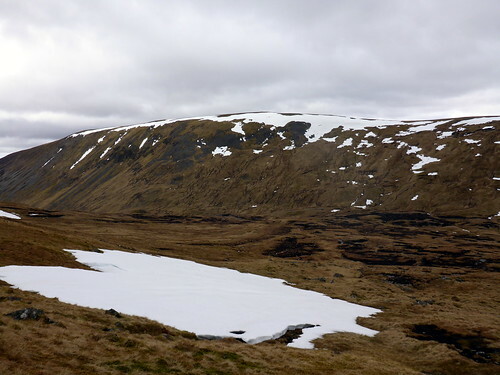 We both set off down the northern slopes of Dearg where there was more snow cover and parted company at the Tarf Water where we crossed and had lunch before starting up Beinn Bhreac. 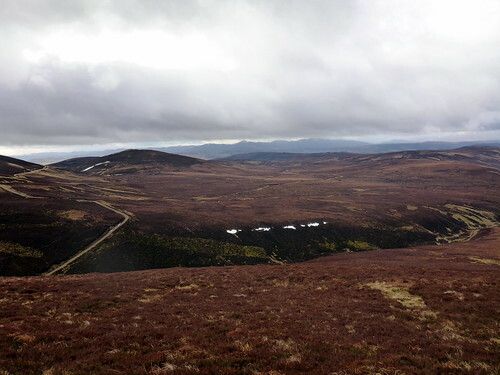 This is a fairly easy 300m ascent and apart from some bog at the bottom was accomplished without difficulty. 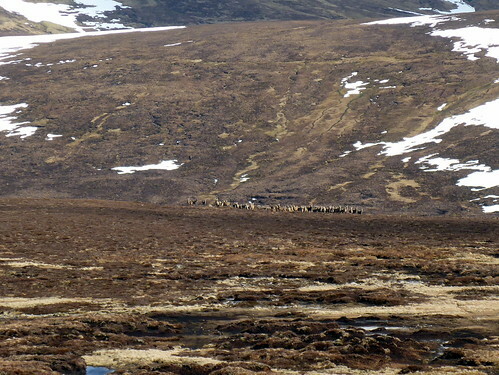 We set off down the NE shoulder towards Cnap a’Choire Chreagaich and encountered a big herd of deer in the distance, who milled around for a bit before catching a whiff of us and disappearing fast. 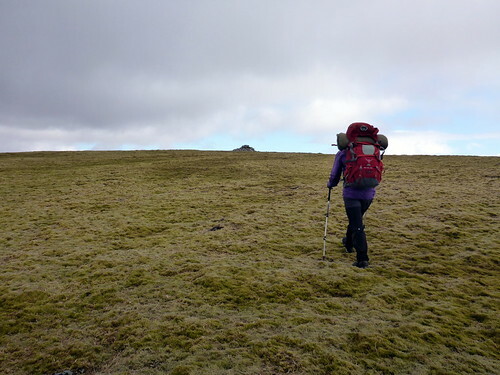 On over peat hags then up the easy grassy slopes of Carn Ealar, the wind pressing us along from behind. 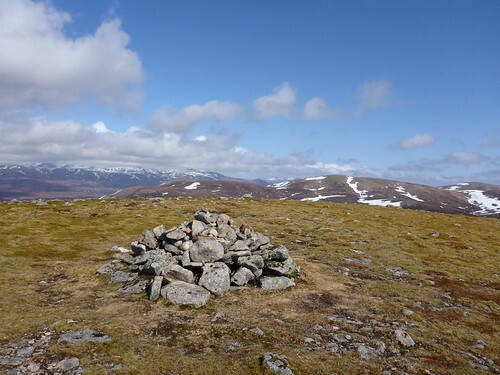 At the cairn we saw across to the Feshie hills of Mullach Clach a’Bhlair and Beinn Bhrotain, as well as the drop down that we’d have to undertake to get the final hill of the day, An Sgarsoch. 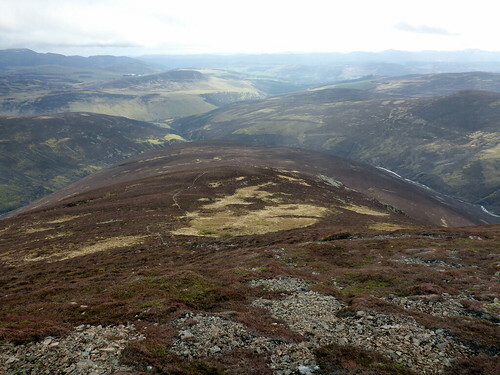 Ach well…The wind blasted across us as we headed southwards then descended, mostly by a lengthy bum slide, into the dip between the two hills. 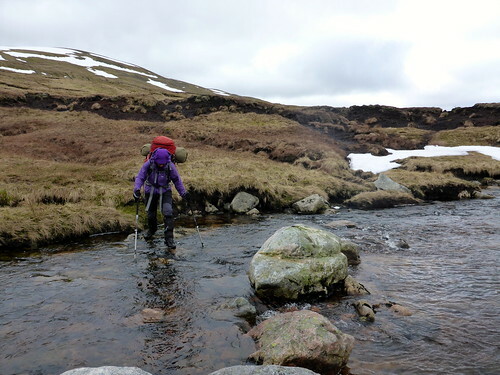 More peat hags to traverse then up the steady gradient to AS. 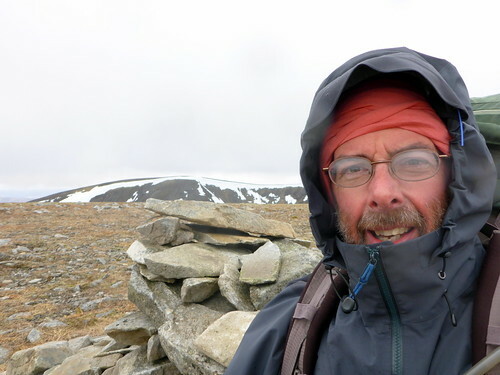 The wind turned up another notch at the summit and it was quite difficult to remain upright. 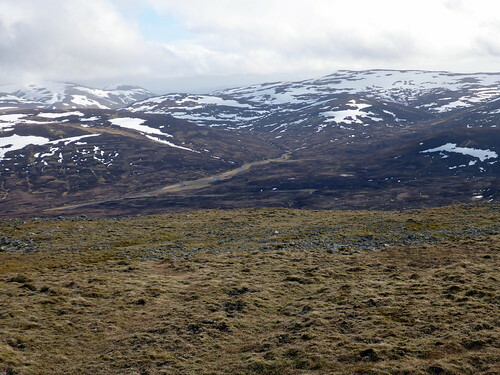 Over the rocky ground towards Sron na Macranaich and off in the distance we could see the Tarf Hotel aside the river. It took a fair time to get down this hillside and we deviated a bit further east than my route suggested, which meant that the river crossings of the tributaries of the Tarf Water were nearer the river and therefore more substantial - we decided that, due to a lack of stepping stones to simply wade across in boots & gaiters – this worked OK for the first crossing but by the third and deepest crossing just before the Hotel it was a case of sodden boots/socks and trousers to the knee. Sick Kid, who hates river crossings at the best of times was ready for my blood. We got to the Hotel, to find it unoccupied and very recently refurbished, with newly laid floor, doors and a selection of new sleeping platforms. Looks great, and clearly should get another AA ‘star’ now. It was around 5.30 and I reckoned we’d get some company given that it was a Saturday night. 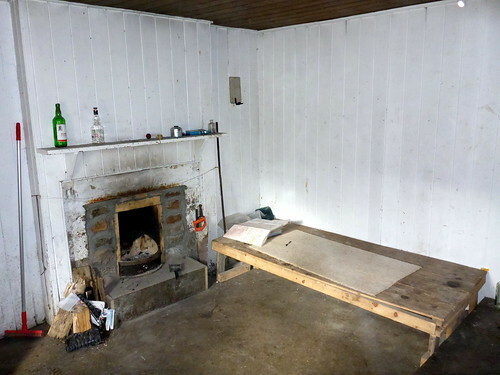 We tidied up a bit and I manifestly failed to get a fire lit – although there was quite a lot of trash wood from the refurb, there wasn’t enough dry kindling to get a fire going, so with cold and wet toes we headed for the sleeping bags after a pleasant meal of noodles with extra chopped vegetables. 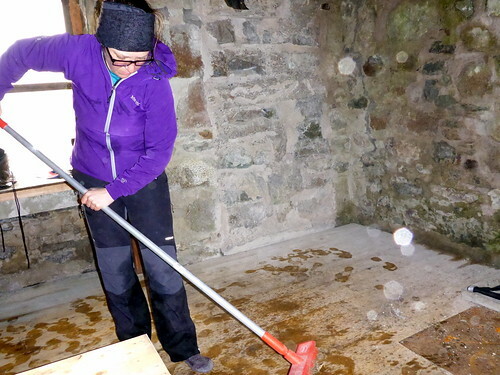 As night fell a big yellow moon arose in the sky, bathing the bothy in light. I lay awake waiting for hordes of carry-out carrying party-goers coming over the hills to take over the place, but no-one arrived at all and we had a quiet, if cold, night. 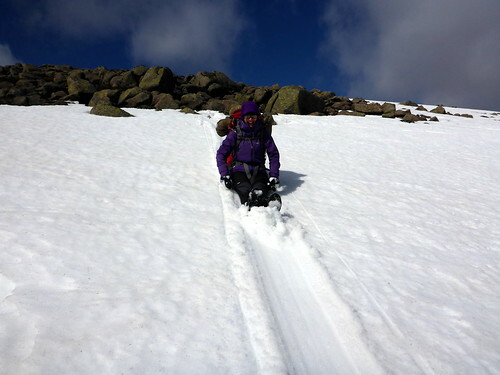 I was a bit achy after a day with full pack when I rose the next morning, but some porridge and a few stretches helped. 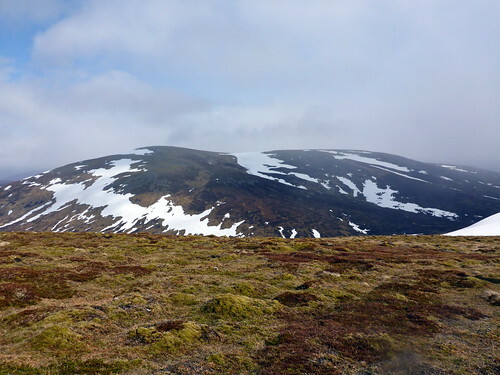 Once we packed up we headed for Meall Tionail which had a steepish snow clad section, then through more peat hags to Conlach Bheag before the final climb up to Carn a’Chlamain. 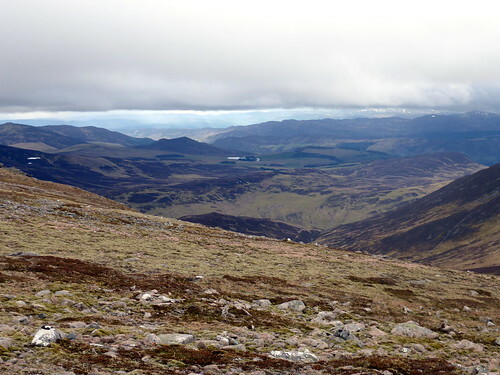 To our left were the hills of Beinn a’Ghlo, tops concealed by a line of cloud. 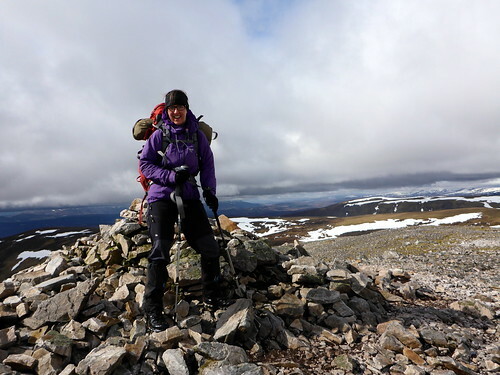 It was very windy up at the summit and we didn’t linger long, heading west to get our final hill of the weekend, Beinn Mheadhonach. I hadn’t climbed this one when I did the circuit previously. 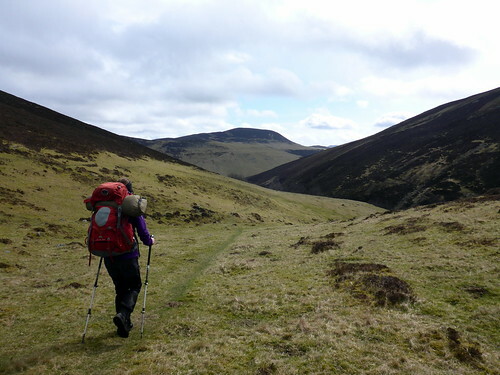 For a few moments I tried to convince myself that we were heading for the benign gentle slopes of the hill I could see ahead, but that turned out to be Braigh Clais Daimh and not the hill we were after at all, which came into sight behind it as a steep sided and somewhat intimidating hill. With a big drop to cross to reach it, of course. 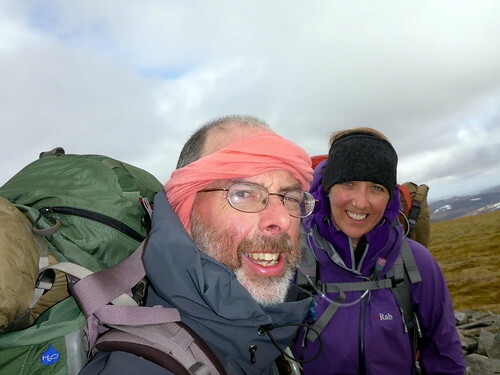 We were both a bit sore from the big packs and the buffeting by the wind, but it had to be done. 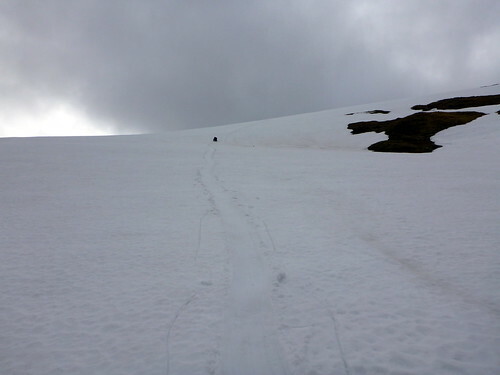 As we drew nearer, what had looked like horribly steep grassy slopes did begin to appear more manageable, but we still took a more gentle line of ascent than I’d originally plotted. In fact, it wasn’t that bad. 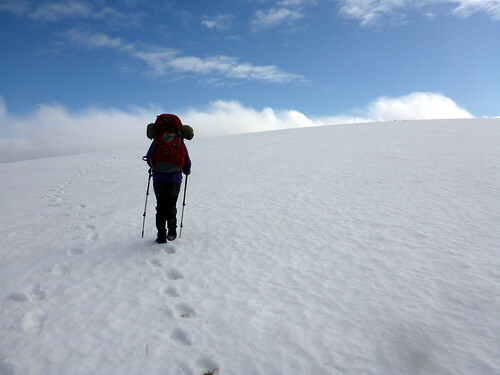 In some places we were shielded for the wind, which meant that we got hot from the effects of sunshine and exertion, then the wind would blast us again. 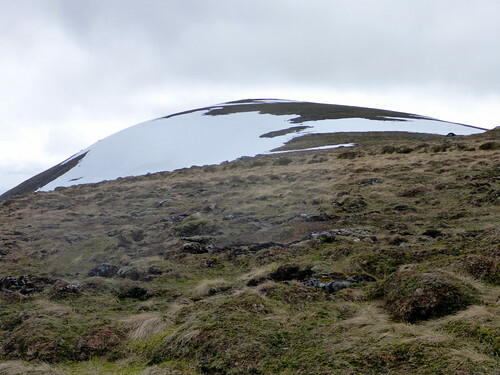 We made it up to the lengthy summit plateau, with patches of snow to cross, before we got to the pile of stones apparently randomly dumped on one part of level ground that looked neither higher nor lower than its surroundings. Not a very dramatic summit. 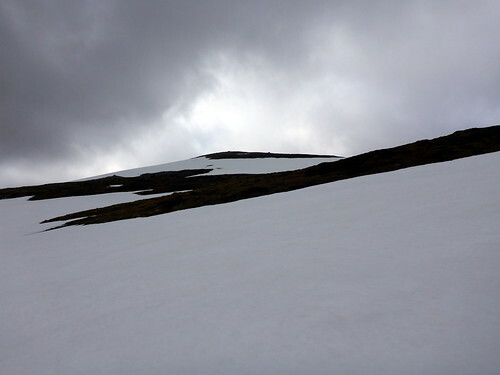 Over to the right the cliffs of Beinn a Chait were ominous – dark rock with a line of snow. 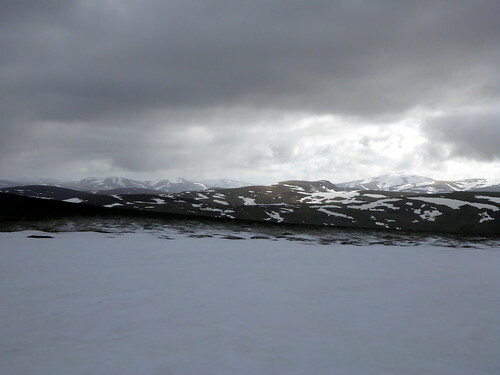 At this point the weather closed in, with a brief snow shower. 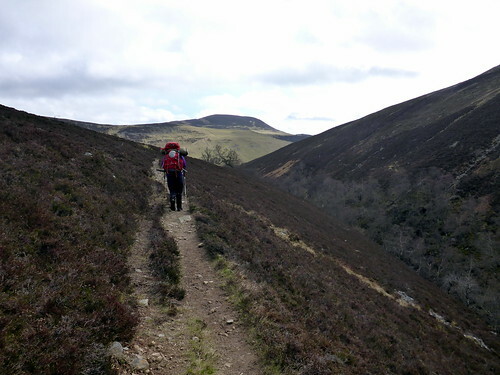 It didn’t last long and we headed south down the long whaleback of the hill, over springy heather with a good path. 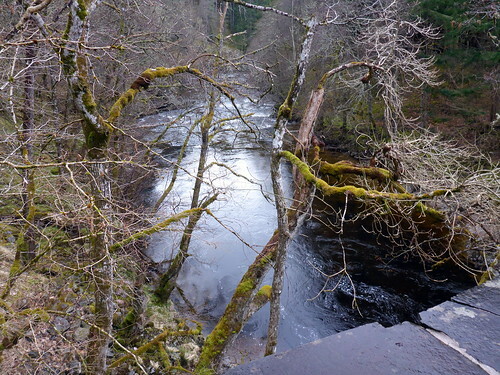 The sun came out again as we headed down to the bridge over the Allt Mhairc – a real old-fashioned proper stone bridge with a troll underneath and everything. 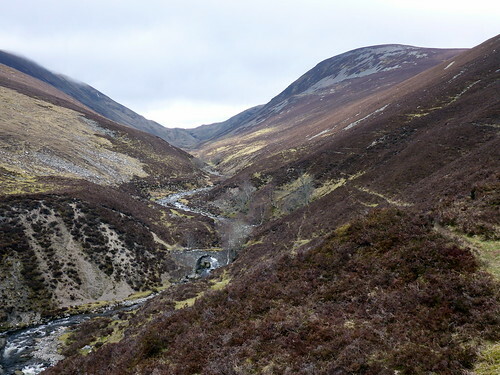 Then along the lovely Glen Tilt with the shots from the rifle range reverberating around the hillside. 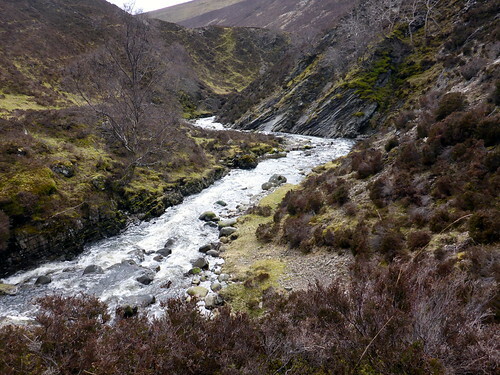 We had to take the diverted route over Gilbert’s Bridge due to the shooters, but this gave a good look at the course of the River Tilt, with dramatic clefts cut through the rock. The rain came on as we wandered through the woodlands back to the car park. 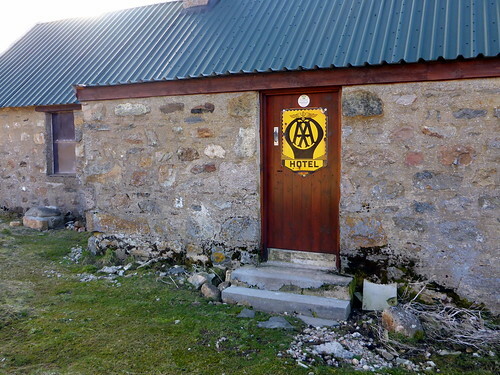 It had been a great weekend and a good introduction to bothy life – should have remembered to pack a little kindling and a firelighter or two as that would have improved the Tarf Hotel experience significantly. I’d definitely recommend tackling the Tarf 6 this way round though (unless you’re a Monty and can just do it in a day). Superb effort! 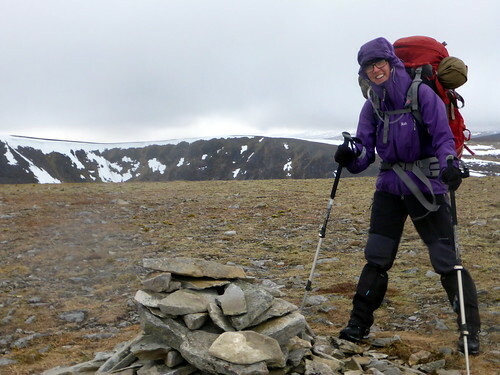 Kind of you to allow Alison to catch up with your munro tally. 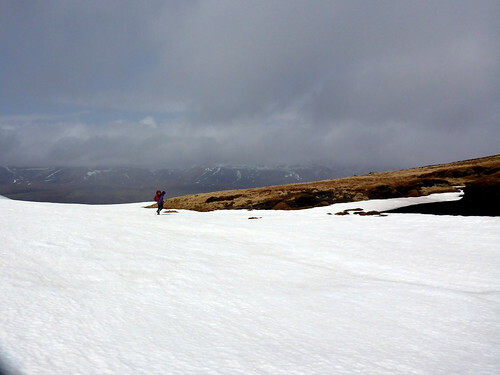 Silverhill wrote: Kind of you to allow Alison to catch up with your munro tally. Oh that looked really braw I really enjoyed reading it. I think it was the first WR I posted on here.. Sheer madness! 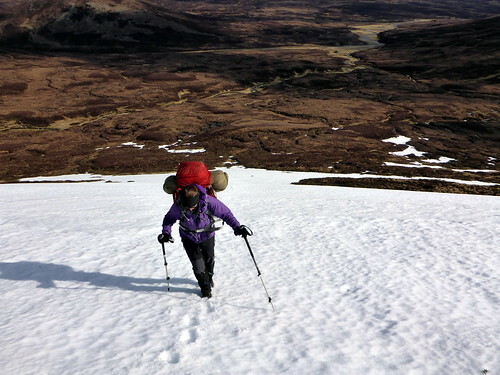 Inspired by this report, me and the Mrs had a similar adventure over the last few days minus the wet weather. 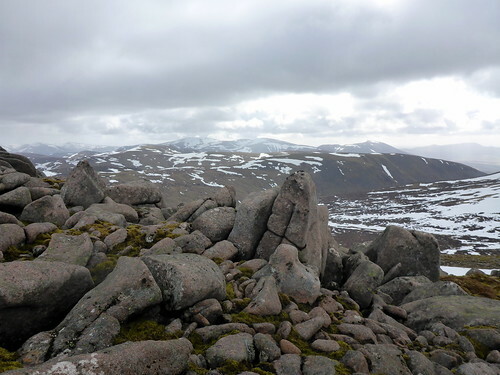 Didn't do both Corbetts but added Carn nan Gabhar at the end for good measure. Had a fantastic time. 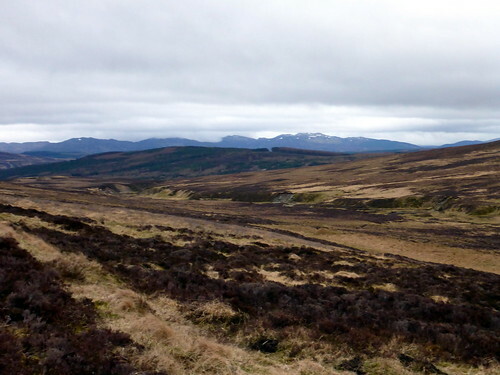 Just love the remoteness of these munros. 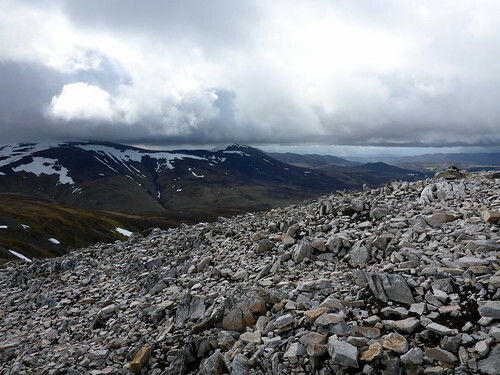 Amazingly met someone on Carn a Chlamain on Saturday who mentioned you and said you were 'completing' yesterday. Hope you enjoyed it and had good weather. We had a great time and are indebted to you for writing such an inspiring report. We had 3 nights out mind you, camping and using the Tarf Hotel one night. We are novices and couldn't quite manage it as quickly as you! Remembering your report and your dilemma with the wet socks we took river shoes (which we didn't need of course because it was pretty dry) ,but we also took fire lighters and left them at the Tarf Hotel so a poor soul arriving in a similar state to you will hopefully have less of a chilly end to their day. Thanks again ,will be reading some of your other reports for further inspiration! pvanlieshout wrote: :thumbup: Inspired by this report, me and the Mrs had a similar adventure over the last few days minus the wet weather. 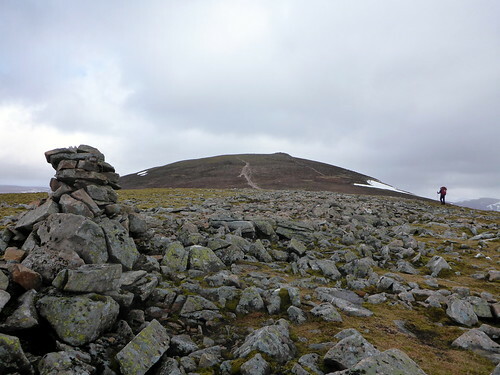 Didn't do both Corbetts but added Carn nan Gabhar at the end for good measure. Had a fantastic time. 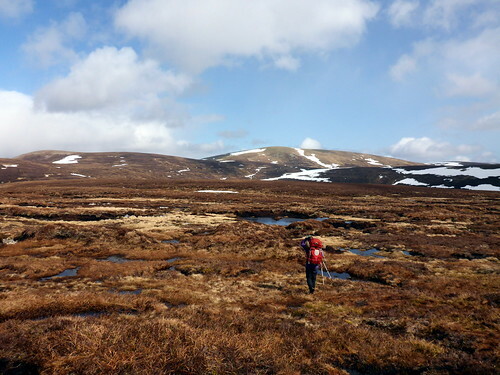 Just love the remoteness of these munros. 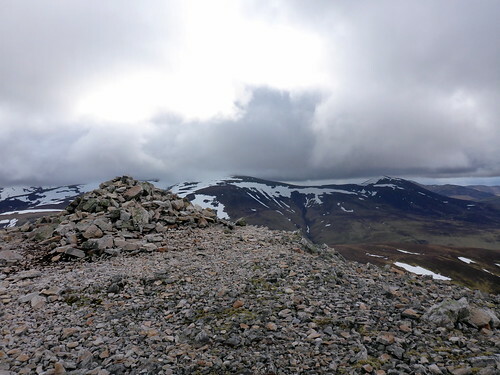 Amazingly met someone on Carn a Chlamain on Saturday who mentioned you and said you were 'completing' yesterday. Hope you enjoyed it and had good weather. We had a great time and are indebted to you for writing such an inspiring report. We had 3 nights out mind you, camping and using the Tarf Hotel one night. We are novices and couldn't quite manage it as quickly as you! Remembering your report and your dilemma with the wet socks we took river shoes (which we didn't need of course because it was pretty dry) ,but we also took fire lighters and left them at the Tarf Hotel so a poor soul arriving in a similar state to you will hopefully have less of a chilly end to their day. Thanks again ,will be reading some of your other reports for further inspiration! Quite a coincidence, your meeting on the hill....who was that, I wonder?